While you Relax...We will take care of your smile! You are here:Home » Posts tagged "Cosmetic Dentistry"
Question: I keep seeing more information on cosmetic dentistry all of the time. Could you explain what this entails and how it can make a difference for me? This is the process of improving one’s smile and overall appearance through many enhancement techniques. At our office our goal is to make all of our patients look the best they can. An article in US News and World report a few years ago stated that 75% of Americans felt an unattractive smile could hurt one’s chances for a career success, and that only 50% of the American public are satisfied with their smile! A smile is the first thing noticed by others and unattractive teeth and smile will often be covered up with facial hair or by one’s hand when smiling. People have even limited themselves in their careers and personal lives because of a bad looking smile. Aging also has a negative effect on the beautiful smile. What happens as we age and how does it affect the teeth and smile? As we age, teeth naturally become yellow and wear down from use and trauma. Teeth yellow as stain fills in the micro-cracks in the enamel layer of the teeth. Another characteristic of aging is the sagging of the face from gravity and the loosening of the skin. This affects the amount of teeth that show when smiling. In the mid-30’s the average female shows about 3 millimeters of front tooth when relaxing without smiling. Then by the time she reaches 60 she won’t show any front tooth when relaxed. The teeth are evenly spaced and shaped the same on each side of the face. The gum tissue that frame the teeth are pink and healthy, meaning they don’t bleed. A full smile shows most of the upper teeth and when looking head on you should see between 10-12 upper teeth. Whitening using a safe and effective material that contacts your teeth making them 8-9 shades lighter. The outside enamel layer whitens as the stains are oxidized You can whiten your teeth by wearing a very thin rubber shell around your teeth during the day or night. After 2 weeks of this your teeth will usually show a big change in their color. 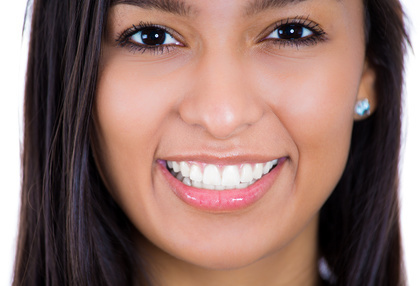 Whitening or bleaching is the most popular and cost effective process to improve your smile. In office whitening using a strong bleaching agent is also possible, but needs to be coordinated with the home whitening process for the best and longest lasting result. Re-contouring of the teeth can be a very effective way to make your teeth symmetrical and in one visit can make a huge difference in their appearance. This is done through minor changes in the shape of the front teeth without any numbing. Braces move teeth to keep them aligned properly. We offer Six Month Smiles Cosmetic Braces that can move your teeth as fast as 6-9 months. This process is a safe and long lasting procedure. Even if it takes more time to do this procedure, it can be well worth the time spent in braces. Veneers are thin shells of porcelain that can lengthen, whiten and strengthen the teeth. By using these we can do “instant orthodontics” and significantly improve the smile in just 2 visits. Veneers are bonded to the teeth using materials similar to those that bond the heat tiles to the space shuttle. Lumineers are “no preparation” thin shells of porcelain that can be used when the patient desires longer or thicker teeth. Typical veneers require very little removal of enamel (0.5mm) to make room for them which is about the thickness of a credit card. If there is confusion about what is best for you give us a call for a free consultation at (586)247-3500. All porcelain crowns can be done so no black line appears around the gums. These are beautiful and look very natural because they allow light to be transmitted through the tooth. Plastic fillings are done instead of the black mercury fillings. These type of fillings not only look like your natural teeth, but they are very strong and durable. They also prevent the teeth from cracking like what happens to the black mercury fillings. All porcelain bridges to replace missing teeth. These can be done in a few positions in the mouth, but they are beautiful and look very natural. If dentures are looking yellow and dingy it may be time to replace them with white porcelain teeth to give you the youngest smile possible. I can’t tell you how many times we treat patients and remake dentures for them that state that the previous dentist wouldn’t listen to them when they stated that they wanted their dentures white. They are usually upset because they felt like they weren’t listened to and even ignored. Presently I find all of my patients want bright white teeth. (And that is what they get). At our office we take a series of digital photos during your examination to show you what we see in your mouth. This educates and keeps our patients well informed of their situation and allows us to discuss the possibilities. The camera is just a tool that we use to discover the smile you have been looking for. If you have any questions about cosmetic dentistry please contact our Macomb County dental office at (586) 247-3500. Hi. This is Dr. Antolak from TheGentleDentist.com in Shelby Township, Michigan. 586-247-3500 is our phone number. I’m just wondering if you’re looking of a way to do an in-office whitening, and if you are looking for a Zoom office that whitens teeth in office. We used to do that. We are your Gentle Dentist in Shelby Township, Michigan in Macomb County. We used to be Zoom users, but unfortunately, many people found that by using the Zoom system, now Philips Zoom is a problem because what it does is it creates really sensitive teeth. The Zoom system does whiten teeth, but unless it’s followed up with home whitening it is very short term acting. The thing that whitens teeth the most is that it requires time to allow the bleaching solution to oxidize and penetrate into the small crevices that are in the enamel layer of the teeth. The Zoom system has an acidic pH. In other words, it’s acidic and that’s how it is actually stored. Because of this, there is the potential of having sensitive teeth. Also the light that it uses actually creates heat and that can make the teeth sensitive also. We do, instead of using the Zoom system, we use something called Kor Whitening. Kor Whitening is a special product that is used to whiten teeth, but it does it in a much more gentle fashion and the results are quite significant. So if you’re looking for an in-office whitening system, we do use Kor Whitening, and we no longer use the Zoom Whitening system because of these problems with sensitivity, and lack of long-lasting effectiveness for whitening. This might be a controversial subject, but it’s something that I feel is very important, and I wanted you to get some insight about why we no longer are a Zoom Whitening dental provider in Shelby Township, Michigan, Macomb County. For more information contact The Gentle Dentist at 586-274-3500. I had to replace a crown on an a recent patient of mine the other day because of a cavity that occurred under an old crown. They were surprised to find out that it was possible for this to happen and thought this would be a great topic to address. I would like to discuss how cavities form and then how they can get under a crown. My hope is that for those who don’t understand this would have a better understanding and it will eventually make more sense how his occurs. Cavities or dental caries form when calcified tooth structure looses its mineral content from constant exposure to plaque (bacteria) and sucrose (sugars). If there are areas in the mouth that seem to accumulate food then it is probable that cavities will form. Food contains a mixture of simple and complex carbohydrates. Bacteria found in the mouth forms plaque and use these food products as a food source and as a by product they form acids. These acids dissolve the hard minerals in the teeth forming a soft dark mushy area. Cavities can develop on a natural tooth or where there is natural tooth exposed. Diets high in sugar put the patient at a high risk of forming these cavities. This, in combination with poor dental hygiene, put the patient at risk of requiring multiple fillings in their teeth. As you can see on the left photo there are three areas where cavities form. (It is no coincidence that these are the areas where fillings are done). 1. In between adjacent teeth and on the smooth surface of the tooth: This is the location that is at risk when getting food caught between the teeth. Flossing on a regular basis helps prevent cavities in this area. 2. The biting surfaces or Pit and fissure: This is usually the first areas where cavities first form. Dental sealants are used to prevent cavities in these locations. 3. Root cavities take place in our geriatric patients who have had recession of the gums and bone. When people age they are more likely to loose bone and this exposes the dentin (root) of the tooth. This is much softer and contains less mineral than the white enamel making it at higher risk of cavities. Combining this condition with the fact that dry mouth plagues most seniors. People who have a dry mouth are at risk of tooth decay because the saliva’s natural healing and remineralizing properties are not present. I usually find that they try to quench their thirst with high sugar containing drinks and candies. This is a deadly combination leading to a triple onslaught to the teeth therefore cavities are inevitable. In fact, it seems like it is a constant battle to see patients who have a dry mouth (xerostomia) return to our office without a cavity. We usually have them on a fluoride rinse and tooth pastes to remineralize the teeth. Dental Crowns cover the majority of a tooth but if a portion of the tooth becomes exposed then it is possible for cavities to form. (refer to the photo on the right) Those who have recession are at risk as discussed previously. It is also possible for food to get caught and wedged between adjacent teeth and even dental crowns if they do not have good contacts between them. I would define a “good contact” when dental floss snaps as it passes between the teeth. This tight fit naturally prevents food from packing and keeps the soft tissues and teeth in good health. When this contact is inadequate from poorly made crowns, shifting teeth caused by missing teeth in the jaw or poorly done fillings it can be irritating when food gets packed in between the teeth. What is even worse is the fact that large cavities can form. In my experience these can grow fast without the patient even having a clue that they have a problem until it is too late. These can progress until one day they come into our office with a bad tooth ache, extremely swollen gums or a bad taste in the mouth. One would assume that flossing would be enough to prevent problems that ensue when food is chronically getting caught between the teeth but the reality is that residual food particles just can’t be adequately washed away with brushing or flossing. If the above scenario describes you then don’t wait any longer. Get to your dentist and have it taken care of and if you don’t have a happy dental home then give us a call or visit our web site at TheGentleDentist.com. If you have any questions regarding this or have any areas in your mouth that require treatment or even a second opinion feel free to contact our office. If you have a question about cosmetic dentistry or oral health or comment that I can post on the “Ask the Gentle Dentist” column please contact us by calling our Shelby dental office at (586)247-3500. There are many developments taking place in dentistry, nutrition and overall health. I will attempt to bring you the latest information as I discover it and as it rolls across my desk or in a journal. Because of technology and research there is an overall increase in the health of the average American and the life expectancy is increasing over the last few decades, we are in a very exciting time. Are you putting off going to the dentist or are you finally going to start to become invested in your health? When I interview those who have avoided their treatment usually state that fear is the primary reason why they have avoided going to the dentist. The fears that these people talk about evolved when they were a small child or teenager and had a horrible experience. It amazes me to reflect in how dentistry is today in comparison to the way it was back 40-50 years ago. In general, the dental profession is more in tune with the individual needs of the patient. Anesthesia is newer and much more effective. The “shot” is virtually pain free. Fillings are white and strengthen the teeth. They are natural looking and are much smaller and conservative. Oral sedation is available so those who have extreme fear can be treated in a relaxed fashion with little memory of the procedure. Using lasers to detect cavities well before they are observed by traditional methods. Digital x-rays instantly show up on a computer using 10% of the radiation. Replacement of missing teeth with implants is pain free and can be done without affecting other teeth for support. Periodontal Disease treatments can reduce the risk for heart disease, diabetes, low weight babies and other systemic problems. Minimal invasive dentistry embraces the concept that “less is better”, thereby leaving more of the natural tooth for support while improving the appearance and health of our patients. This year why don’t you move forward and help yourself by getting your mouth and health checked out? Please feel free to contact me in the most convenient way for you if you have questions, comments or information that would be beneficial to the readers of this publication. It would even be my pleasure if you stopped by the office to say HI or to comment or to pose a question. Our dental office is located in Shelby Twp. at 15055 22 Mile just west of Hayes Rd. Our phone number is 586-247-3500. Hi, my name is Dr. Robert Antolak at thegentledentist.com in Shelby Township, Michigan. We’re on 22 Mile just west of Hayes, right on the border between Shelby Township and Macomb Township. We at our office are very proud of what we do and how we treat our patients. I’ve been in practice for 26 years and am constantly working on improving what I do. Dentistry is a profession that is constantly in motion, and things are constantly changing. What I do is go to a lot of continuing education courses on cosmetic dentistry and on implant dentistry. The fields are changing quite rapidly. And what I want to do is to just inform you a little bit about why people come in here. You know, I ask people as a new patient, why did you decide to come in here? You have lots of different options, but why did you choose us? Many of them will say it is because of the reviews that were given. They say, it has really good reviews and they also say, when I looked at your website, I looked at all the people who work there, I looked at that page and I liked what I saw and the people seemed friendly. The truth is that what you see in there is the reality of how it is when you come into this office. We really focus on our comfort of our patients. We don’t do anything, any type of treatment that they do not need, nor do they desire. Everything is individual and so people are basically available to render their care and how they want to be. So, if they tell me what their end result will be like, we’ll do what we can to do that and stay within their budget. What I’m holding here in my hand is years of before and after photos. I’m aware that on our website we have a number of people who have been seen here. Those are the people that we basically decided to post, but we have many, many before and after photos of people that we’ve been able to positively affect their lives. How is it that we positively affect their lives? We positively affect their lives by helping them feel better about who they are, and helping them to feel better about their smile. You know, some of you watching that feel kind of embarrassed about your smile. What does that mean? It means that our society is such, that unfortunately people judge you by the way you look. People judge you by your smile. And when you know that they are judging you, you certainly don’t want to show that on display. You don’t feel comfortable showing it on display. So what you do? You don’t smile. What happens when you don’t smile? When you don’t smile people think that there’s something wrong. They think, well what did I do? Did I say something wrong to that person? And even though you have no intention of doing that, it secondarily happens where people think that you’re either upset at them or you’re not happy. Even though you could be feeling the joy inside of you, you still don’t have that ability to show that on the outside. So, what we’re able to do is, by doing this, we help people to feel good about themselves. People have told us that they have to learn how to smile again. They actually can smile but it’s their inside, the part of them that is protecting them that doesn’t allow that inner joy to show. So that’s one of the biggest blessings that we have that I feel is when we are able to allow somebody that ability to be themselves to allow the true joy to come out and those people around them have the ability to also see that joy come out. That changes lives. It’s very exciting to me when we can do that. So, if you are one of those people I described, then please feel free to call us up. You know, I don’t have a problem with doing a free consultation, we’ll sit down, we’ll find out what you like about your smile, we’ll find out what you don’t like about your smile. And we’ll see what we can do to resolve that. Also, we’ll find out kind of what your budget is that you’re thinking about working with. Because, you know, in dentistry, there is a full array of options. If we can do that, we will do the best we can to try to help you to understand what’s available and stay within that budget. So if you would like more information about the positive affects of dentistry in Macomb County, Michigan, please, give us a call: 586-247-3500. And the website is thegentledentist.com. Thank you, have a blessed day. Hi, this is Doctor Antolak from thegentledentist.com in Shelby Township, Michigan, and what I’m holding here is a model, a diagnostic model of one of our patients. I do quite a bit of cosmetic dentistry, as you can see from our website, and we’ve actually been able to help a lot of people with their smile and improving it. What I want to do is to show you on a detail of what we do before we start procedures which are more complex. As we take impressions of the mouth, that’s that kind of that gooey stuff that can go in the mouth, it captures a negative image of that. Then we take that and we pour that up in plaster. This is a plaster model here, as you can see. These are made out plaster and it’s an exact duplicate of this patient’s mouth and what their teeth look like. What it does is, this is called an articulator. An articulator duplicates what it would be like in the jaw. So this shows the jaw joint here. If we need to move the teeth around so we can diagnose what the person’s problem is, then we can move the jaw in different directions. I can see forward and backward like this. We can move it from side to side. We can open and close it. What this does is allows us to look and see where the teeth are lined up and what potential problems they might have and it gives us an ability to have what’s called a working model. Something like this. We can do some prototype work so that when that patient comes into that room, we are ready to treat them and do their smile or implants, for example, because we have done it already and the details are worked out in the plan before anything is really done. It’s so important to start with the end in mind. You have to start knowing what your result is going to be. So that you know what the next step is. I’ve had patients of mine that come to me and say they had this done and this done, and then they had had something redone because it wasn’t planned out properly. So what we do at our office is, we take plenty of information, you know we want to interview our patients, so that we will know what their desires are. We don’t assume anything and so after we get done interviewing, we take photos, a lot of high definition photographs, so that we can see what their teeth look like. The position of the lip, the way the lip looks when they’re lips are at rest and relaxed, when they’re smiling, from either side. We take pictures of the jaws from the top or the bottom and what that does is it gives us a really great ability to see as if that patient was actually in the chair. Sometimes, we can even do more information once we have models like this, photographs and x-rays, to plan for the best result possible. Once again, you have to start with the end in mind and that end is dictated by you, the patient,, who will tell us what you want for yourself, the way you want things to look. So, if this is the detail that you like and that interests you and if you want a dentist to sit and listen to you what your needs are and listen to what your concerns are, then please give us a call. Our phone number is 586-247-3500, or visit us at thegentledentist.com. Thank you. Have a great day. Did you know that your smile is the first thing noticed by other people? Do you find yourself hiding your smile by limiting how much your lips rise up when you want to smile? Are you the one who is taking the pictures because you don’t want to be seen in a photo as your smile embarrasses you? Allow yourself the freedom to be all that you want to be by contacting Dr. Antolak, the Gentle Dentist in Shelby Township, Michigan. Dr. Antolak has 26 years of experience in producing fabulous smiles for those in the Shelby Township area. Dr. Antolak, The Gentle Dentist, makes you feel really comfortable by being non-judgmental and really hearing your needs first and then offering recommendations that meet your budget. His goal is to understand you and to create a relationship so that trust can be slowly established. He and his team will sit down with you to make sure you understand your options and make a decision that makes the most sense to you in creating your new dazzling smile. Bleaching or whitening of the teeth is the most cost effective method and most requested form of smile enhancement. This can be done if the teeth are darker than you would like them to be. Bleaching will not change the color of existing fillings or crowns so they may need to be redone to match the new whiter teeth. Porcelain Veneers are thin shells of porcelain that are bonded to the tooth. This can be used to change the shape and size of the teeth. If you have spaces between your teeth or your teeth are too short then dental veneers can be for you. Porcelain Crowns are used when one has cavities or large fillings in the front teeth. The porcelain crowns are made out of the same material as the veneers are so they must be bonded to the remaining tooth. Braces or Clear Correct are methods used to move the teeth into the proper location, providing treatment without modifying the physical characteristics of the teeth. This usually takes a significant amount of time to enhance the smile. Clear Correct or Invisalign are treatments used to move teeth using clear plastic trays that are made to progressively move the teeth. Soft tissue modification: This is used if your smile is shows more of your gums than you would like. If your teeth look too short, it may be possible to remove some of the gum tissue to enhance and increase the amount of teeth displayed when you smile. Implants can be used to replace missing teeth that have been extracted previously. Are you in need of Cosmetic Dentistry in Rochester, Michigan 48306? Even if you weren’t born with a beautiful smile, you can still have one! Do you live in the Rochester area and are considering cosmetic dentistry? Give us a call today to make an appointment for your smile analysis with Dr. Antolak. Using digital photography and careful analysis of your smile we can show you what is possible. If you are tired of hiding your smile because of the embarrassment and would like more information on cosmetic dentistry in Shelby Township, Michigan 48315, then give us a call at (586)247-3500. Hi, this is Dr. Antolak from thegentledentist.com, in Shelby Township, Michigan. 586-247-3500 is our phone number. I bet you’re wondering what the heck I’m holding here, aren’t you? Well, this is called an articulator, and this device right here is called a face bow. And what these are used for is to accurately mount a plaster duplication of someone’s jaw and teeth. This is required because it gives us a more accurate impression and a more accurate, what we call a mounting, so that the results that we do for our patients are more accurate and precise. So, if this is something that would need to be done, we would actually put wax on this top of this here. Soft wax that would go in the valve and it goes like this, okay. And then goes right up to the ears and goes in the ear canal. And what we do is we adjust these things here; we adjust this back and forth so, then we create the relationship between, right here is where the ear canal is and right here is where the upper teeth are. Then we take that and we mount, we take it off of here and then we place it on here and then we mount the teeth to there, and so what that does- it creates an accurate 3-dimensional duplication of our patient, so with that I can take that information and then transfer to our laboratory. And then when they make it, they can have very accurate representation of ways the jaw moves back and forth and how it moves up and down. So it goes back and forth like that and then we can do a mounting and that type of thing. This is the type of work here that we do. We communicate with our laboratory in Macomb County, Michigan; actually, it’s called Macomb Dental Ceramics. So it’s just located a few miles from our office so we can do this accurate information, and get a very good result using our digital cameras for pictures, and also for this type of accuracy in those cases for different cosmetic procedures. So if you’re interested in the level of care that I’m talking about, to get a good favorable cosmetic result in your dentistry, then you can give us a call at 586-247-3500. Thank you. Hi. This is Dr. Robert Antolak at thegentledentist.com in Shelby Township, Michigan, and what I’d like to show you is the effects that we can have from doing whitening on people’s teeth. You know, whitening is one of the most recommended and one of the most requested procedures that we do to help with cosmetic dentistry. Many times we’ll do an arch of teeth. For example, if we do the top teeth making it nice and white the bottom teeth sometimes are a bit dingy. So what I’d like to do is to talk, to show you a way that we whiten the teeth that is like nothing else. That’s called KOR White. This is just an example of some of the pictures that KOR White can do. So, for example, these are the same color tabs here. This is before, and then after the things that can be done. The difference between KOR Whitening, and some of the other systems, is that it’s designed, and formulated for those people who are sensitive to their teeth, as they start weighting their teeth, their teeth can sense it. The reason why that is, is because of the way that it’s packaged. KOR whitening is a product that is for transportation, they actually need to have it in refrigerated form, because that is a preservative, and the reason why it needs to be preserved with refrigeration is that it’s at a neutral pH. Other products that are used, use an acidic pH to be preserved, and so, in other words, an acidic pH, wen we want to bond teeth, we use an acid that etches the teeth, which can make them sensitive and this product is at a neutral pH, so it is not as harmful to the teeth, as far as making them sensitive afterwards. And another reason why it works so well is because just the formulation and how even is is, these are just some examples of what to expect. With this sheet here and then this is after the whitening. One other thing with KOR whitening is that it does not require a light. Many times the light that is used to intensify the bleaching agent will actually create the heat, will actually create sensitivity to the teeth. So, this works really well to help reduce that and yet still get a very nice result. So if you would like the alternative and if you have really pretty dark teeth and you’d like to see a change in that, then you can give us a call and we’d be more than happy to talk to you about that as an option. The one difference is, the KOR whitening costs about twice as much as the regular whitening, and the reason why is the cost of the materials themselves. We buy it and it is much more expensive than it would be compared to an over the counter or, you know, whitening agent that we use, which is effective, but maybe not as effective as a KOR whitening product is. So, if you would like to get an assessment with your color of your teeth- by the way, the color of the teeth that will whiten the most are teeth that are, have a yellowish color to them. And for myself, I did that to myself. So I’ll show you here. I haven’t retouched my top teeth in probably over a year. But this is my top and these are my bottom teeth. See, and I whitened my top, and I didn’t whiten my bottom. See that? And so, people ask, why did you do that? And that way I can show our patients the color of the teeth and what the effect that whitening can have. I know it’s a little odd, but it does work, and you can see the effect that it does have. So you know, if you like to do for those assessments, or evaluations on your color of your teeth, and what we can do for you cosmetically. Our phone number is 586-247-3500 or you can visit us at thegentledentist.com. Thank you, and have a blessed day. Shelby Township Dentist: Hi, this is Dr. Antolak from thegentledentist.com in Shelby Township, Michigan. The phone number is (586) 247-3500. And one thing that we do in our office is something called the snap on smile. Snap on smile has a number of functions to it. But basically, if someone comes in, this is not Veronica’s mouth, but if it were, this is what her teeth would look like. So, basically, we’ve got teeth here, missing teeth, and the Snap on Smile is made. It’s all one piece. It’s very, very durable; you can actually use it where it snaps over the teeth. So we can change and lengthen teeth. We can fill in the gaps on some of the teeth and we do it with just one component. It’s not a permanent solution, but it’s one that does last a while, and we’ve been able to have some very favorable results with the Snap on Smile. One very unique indication we’ve had is with Veronica and I asked if we could just do an interview about some of the things that have taken place for her. Veronica came in and we’ve been seeing you for how many years now? Shelby Township Dental Patient: About 2 years. Shelby Township Dentist: A couple years. So you’ve had it for a couple years. And one issue that you had was your jaw. Because she has some bad jaw problems and some arthritis in her jaw joint. So the only way she could really function was with her lower jaw pushed forward slightly to take the pressure off the jaw joint and for her to be at ease. I remember you came in one time with a dental quote of thousands and thousands of dollars. Shelby Township Dental Patient: Yep, $25,000. Shelby Township Dentist: $25,000 and I looked and we started discussing it, that you had an issue more with your jaw joint, more than anything. You were using something to keep your jaw forward when you sleep, but then during the daytime you weren’t using it because you have to function. So, a very unique concept that we had was, I thought, “my gosh, why don’t we use a Snap on Smile, and we’ll design it to keep your jaw moved forward for your lower jaw and your lower teeth.” Right? Shelby Township Dental Patient: Yep. Shelby Township Dentist: Tell us how that worked out for you. Shelby Township Dental Patient: I’m a schoolteacher, and I can teach all day, and I don’t have jaw pain. My jaw is able to be relaxed and it’s very comfortable. I think it works great. Shelby Township Dental Patient: No, I wouldn’t be able to talk. Shelby Township Dentist: You wouldn’t even be able to talk? Shelby Township Dentist: So this is a really interesting… Thank you for letting us videotape you, for doing this, too. But it’s a testimony that we can become creative in some of the types of things that we have available to us for different purposes that are not always what the intention is. For this case, we really helped you in two manners. Number one was, we helped you with your lower teeth, and to make them look better. And number two was, we were able to position your jaw forward so you can go behind wearing the one at night time that you normally would wear. Then, this one, for function, so people don’t even know that you have anything like that going on. Shelby Township Dental Patient: Yep, it works. Doing a great job. Shelby Township Dentist: Doing a great job. You’re so good. So thank you. If there are any questions about the Snap on Smile or any other types of dental procedures at our office, we do most everything, in house, give us a call. Our phone number is 586-247-3500, and our website is thegentledentist.com. Thank you. Dr. Antolak: Hi, this is Dr. Antolak from thegentledentist.com in Shelby Township, MI, and sometimes people have issues with having emergencies where they do some trauma to their front teeth. And, our friend Aaron here, can you describe what happened? Dental Patient: Well, I was trying to remove a socket from a ratchet, and slammed the ratchet right into my face. Dr Antolak: And, what happened is right here. These teeth broke off here. So, right now, the most important thing was he saved a couple of fragments. This broke up in to a number of different pieces, but you can kinda see, this is a piece that we’re going to end up using. We’re going to actually bond this segment to his tooth here. And the other one’s going to get bonded to the other tooth. And then we’re going to basically back fill it with the composite materials that we use. Which are light cured. And we will see what that looks like as we do it. But we’re going to take our bonding agent, and prepare both sides of the teeth. And kind of glue it together, and then fill it with other materials. And so we’ll show you what it looks like. Okay. So we’re going to go ahead and we’re just, that’s the surface of the tooth. Now we’re applying what is called a bonding agent right to it here. What this is going to do, is this is going to make it so that we can bond these segments together in pieces and so even I’ll apply this to the fragment of the tooth. He called yesterday. It was a Sunday and I said store it in water. He doesn’t have any pain so that was good. And so we are just going to apply a little bit of that to it and then we are going to blow up. So right now, those 2 pieces that I had… this is part of. Here that has broken. We don’t need a light. And the other part is right here and we can see here, these are the 2 pieces. So we’re going to have to try to create some aesthetic appearance now between these segments that are broken so that it looks nice, and finish it up. So we just applied a thin material here and then bonded them together. And then we’re going to make sure they’re done. So, we’ll see what it looks like we’re done. Come in. You ready? Dr. Antolak: Okay. So we have a base color here that is going to be a little bit darker and we can notice on his teeth, that we have a little white opaque color to it. So we’re going to have to make this into a couple of different colors. This is kinda like taking a wallpaper for example, and part of that wallpaper got torn out. Now we have to, without having any other wallpaper samples now we have to try to make it look good. So as we can see in his teeth he’s got, this is like a base color underneath it we’re going to leave a little bit of a space there. And we’re going to put an opaque white color in there. And to kind of frost it and make it look like it blends in with his other teeth. So this is called composite material, and, we can, reshape it and it works wonderful. This is actually what we do all our fillings out of, the front fillings or back fillings, and it allows us to give it the natural color of a tooth and yet have very nice aesthetics so it looks good. So we’re going to cure this now with a light. Then we have a special orange shield that we can do over that, so we’re going to just let that harden up. That light hardens it up. There’s an opaque color to go over that to give it a little bit of different depths. So if we look at this it looks that same color there, but his teeth you can see he’s got where his natural tooth was here, he’s got this white frosty appearance to it, so we’re going to try to duplicate what that looks like a bit more. So we’re going to take a little bit of material here. And, kind of, get it through the filling itself and, give it a little bit of a speckled look to it. Then we’re going to cure it with a clear material. Dr. Antolak: So, we went ahead and finished this up we cured it. And did what we could to, kinda, match the colors and make it look more natural for him. And Aaron took a look, and that’s our final result right there, okay. Aaron’s got his smile back now. We can be happy with that. So now we can put this on YouTube and everybody’s going to see it. You have any thoughts about that, about maybe taking something off of socket? Dental Patient: Yeah, I’m gonna be careful about that now. Dr. Antolak: So we’ll do a do that like I told you before is that now that tooth has been kind of traumatized a little bit so we’re going to have to see what happens over time. In a situation like this it’s been hit and jarred pretty hard. So we’re going to see how the nerve responds, if the nerve responds normally. Or it might need to have the nerve removed in the future if it doesn’t. So we’ll keep an eye on that. If there are any questions about repairs to broken teeth you can call us up 586-247-3500 or thegentledentist.com in Shelby Township, Michigan. Thank you, take care. Dr. Antolak: Hi this is Dr. Antolak from thegentledentist.com in Shelby Township in Michigan. Our phone number’s 586-247-3500. And I would like to talk with Jerry. Jerry is a patient of ours who came in and he had an interest. He saw the Snap-On Smile on a video that he saw. Dr. Antolak: On a website. Okay. And so since then he came in and Jerry had. This is what Jerry looked like here. We have a picture of Jerry right here. He had a couple of teeth that were really hanging out and extremely loose here. So, he had a number of different teeth that he also wanted to have replaced in his upper jaw. And so that was his smile that he had. What we did is we made actually what is called a Snap-On Smile, and this is his Snap-On Smile. And the teeth that we took out are these 3 teeth right here. And there’s some other replacement teeth, but they hook right over the top and clip right over the top of his natural teeth. So, Jerry if you don’t mind, if you can go ahead and put those in and show people how that works. And it’s just going to snap right over his teeth. He’s going to put it in. So, we work on that and also at the time we didn’t want him to go without his front teeth. So we went ahead and at the same visit we went ahead and took his teeth out and gave him the Snap-On Smile. That way he could walk out of here with it on. So its been very good for him and there he goes. So now he’s got a full smile. So I just wanted to ask Jerry a few questions on while we do that. What has this process been like for you to go through that? Dental Client: The cause I had some extractions. Sure I had some soreness it fits perfect. It feels good in my mouth and looks fantastic. I’m very happy with the outcome of it. Dr. Antolak: Good. Now you have the ability now to actually chew food with it in. Dental Client: Yeah, and I changed my bite. Dr. Antolak: We’ll work on that. You brought the bite in. We brought his bite in and his teeth were flared out quite a bit so we brought the teeth in with this device. We were able to replace missing teeth for him, improve his bite, and now we replace his front teeth but he had a couple teeth in the back also that were missing. So we were able to give you a full complement of teeth. Snap-on Smile is something that is not intended for extremely long service, but who knows maybe you can prove me wrong. Dental Client: It’s what kind of food you eat, I would imagine too, you know. It’s too high and you got to be careful. Dr. Antolak: Right, Right. But its a good alternative to having crowns and bridges or things like implants, braces, so its something good for the short term, medium term. We’re really pleased, I’m pleased with the result. And I thank you for this interview. Dr. Antolak: Give me a big smile. Okay. There he is. There’s Jerry. With that we say goodbye. Is It Safe to Get a Dental X-Ray?